A packed lunch is essential as is water to drink along the way. There is a small supermarket at the beginning but opportunities to re-stock along the way are very limited. No other London walk offers such a pleasant challenge. The Green Chain Megawalk is by a considerable margin the longest established long-distance guided walk in London and many hundreds have participated. Some thought they wouldn’t complete such a distance, yet the camaraderie and expert guidance have seen all but a handful achieve an on-time finish. Every one of the participants has taken wonderful memories from the day. Here’s your chance to join the institution! South East London possesses London’s finest landscape but in places the remarkably bucolic components of that landscape are not quite contiguous. The ‘Green Chain Walk’ was laid-out in 1977 to link those Pearls together becoming the Capital’s first long distance footpath in the process. Today the Green Chain network is over 50 miles long and the many thousands of acres of open space and woodland it joins are deservedly to be considered for Regional Park status. The Megawalk carefully balances distance, gradient, landscape, and views to bring a true taste of this exceptional system into one day. We’ll gently climb to some of the highest points in the city, suburbia giving way to outstanding views and much woodland, some established for 8,000 years. For lengthy sections you won’t know you are in a town, let alone the Metropolis, as well over half the route is off-road. After lunch we descend through woodland and across heaths to a splendid complex of parks in Charlton that were a principle location in the 1960s cult film ‘Blow Up’. From there it’s a short distance to our destination at the remarkable Thames Barrier, hopefully glinting in the setting sun. Excellent transport into central London is close-by. The route is steep in places, a packed lunch is essential, and of course you must be reasonably fit. You must also be able to sustain three miles per hour for most of a day and if you think you can, this particularly friendly event is the one Walk London walk that you should do. There is no need to book, just turn up and go, a remarkable day awaits you. The Megawalk is never, ever, allowed to finish late. Should the necessary pace prove wearisome there’s plentiful public transport throughout for a comfortable return home. You are also most welcome to join the walk at any point. 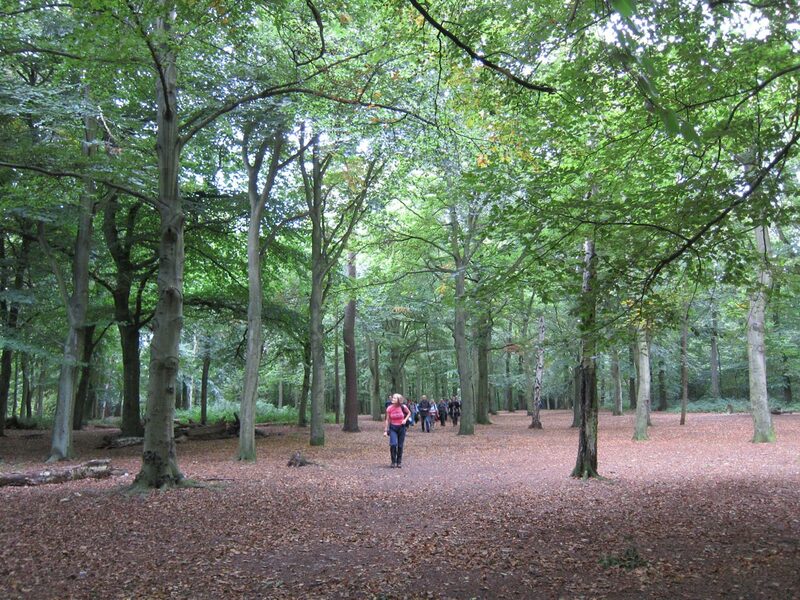 The Autumn Ambles programme includes lots of other great walks, though Ian’s walk on Sunday which takes in Severndroog Castle is unfortunately already fully booked. However Seafaring London – Tower Bridge to Greenwich sounds interesting, as do some of the shorter walks in central London such as The Real West End – Soho, Chinatown and Covent Garden which is just 1.5miles, the same distance as Secret Diaries and Public Spaces – The Legacy of Pepys and Wren. Time to brush off those walking boots. There are some very interesting sounding walks in Walk London’s Winter Wanders this weekend – “Secret Diaries and Public Spaces – The Legacy of Pepys and Wren and Hidden Alleyways” and “Courtyards; Printing, Priories and Prisons – St Pauls to Chancery Lane” both sound fascinating. 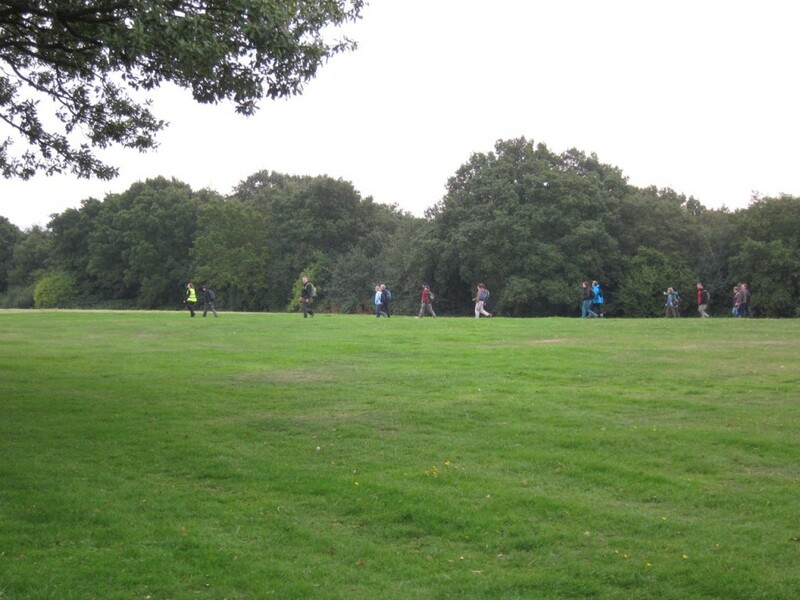 But the one that really caught my eye was the walk led by our old friend Ian Bull: “The best landscape and views in London – Charlton to Plumstead via Shooters Hill“. 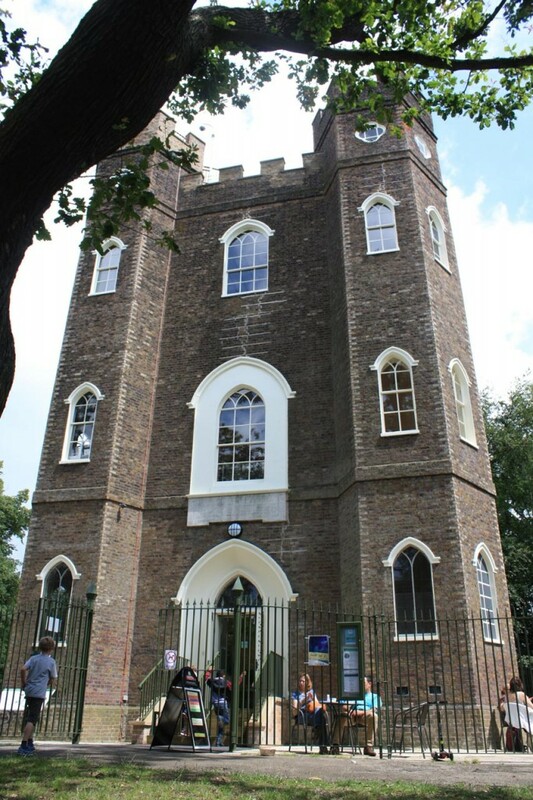 This is a great walk with an added bonus: an opportunity for an exclusive guided tour of Severndroog Castle (costing a very reasonable £2.50) and a chance to see the amazing views from the top. This special walk, historically Walk London’s most popular, was first devised to demonstrate that you can walk through London without realising that you are in a city. It still does, but this time there’s a bonus that turns an excellent walk into an unforgettable experience that you’ll want to return to. The walk takes us through wonderful parkland, heathland, and dense woodland to a very special place that offers stupendous views rivalled only by the Shard. Yes, after years of tireless fund-raising and painstaking restoration Severndroog Castle can at last accept visitors. The walk will feature an exclusive guided tour of this perfectly formed historic building which has an important and intriguing past. The building also has views over London ‘to die for’ and some visitors really do gasp at their first sight of the breathtaking vista. The ‘Castle’ is usually closed at this time of year and is being opened specially for Walk London. We start by traversing a most pleasant complex of parks which include a principle location from the cult 1960s film ‘Blow up’. 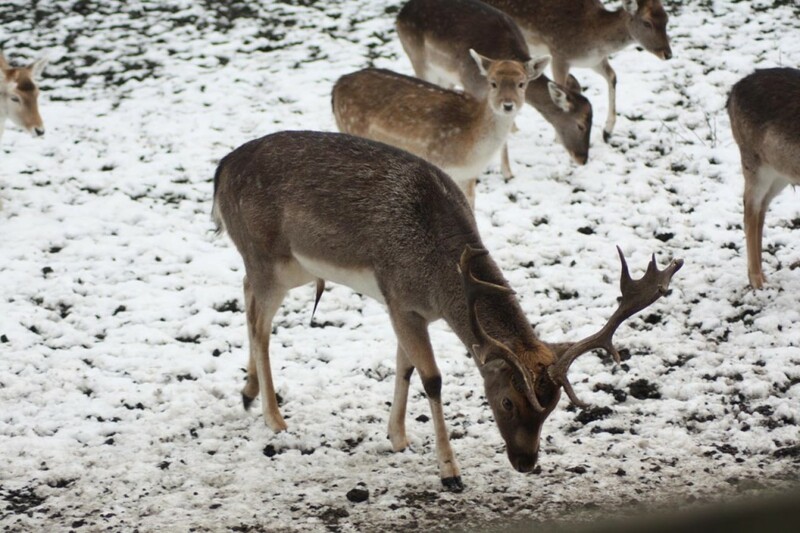 Shortly afterwards we’ll pass some comfortably large animal enclosures, one housing a small Deer Herd which has been present for over a Century. 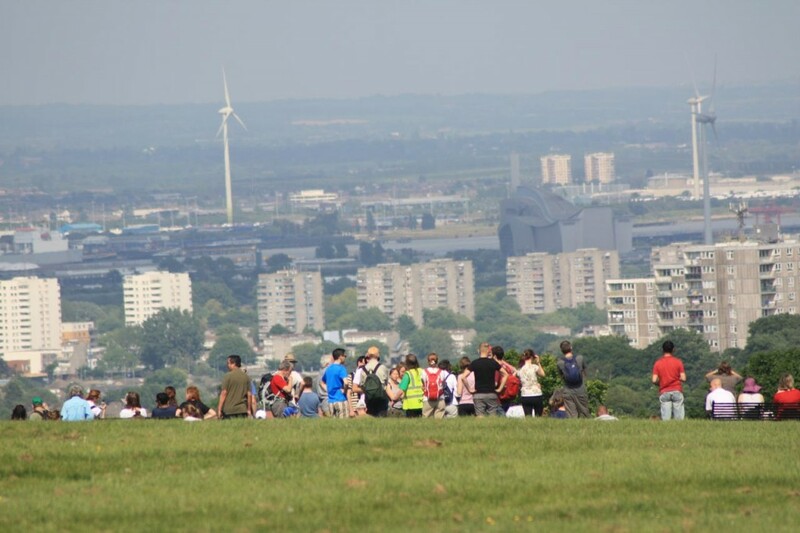 Gentle climbing via Charlton Common takes us up onto the openness of Woolwich Common with distant views of Essex farmland, it’s wildness then giving way to the dense woodland of the flanks of Shooters Hill. 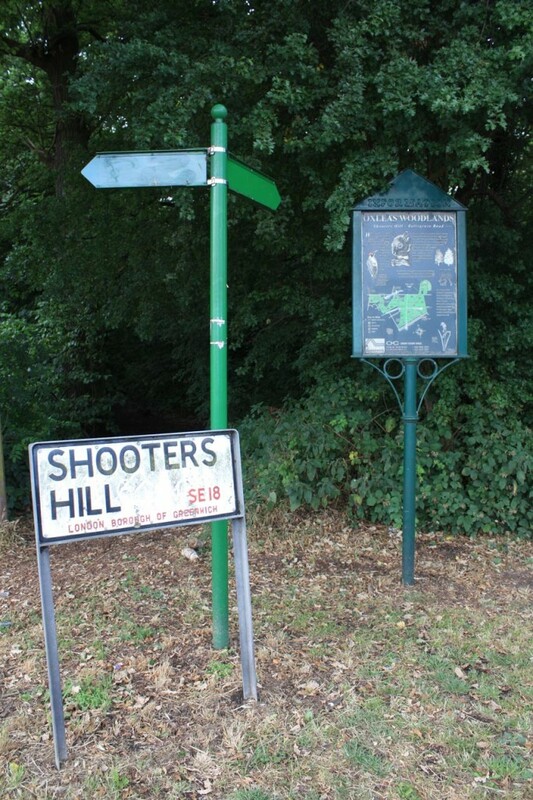 We climb a little more steeply now for Shooters Hill is very nearly as high as the highest part of Hampstead Heath. Suddenly, in Castle Wood, the trees part and before us is the well proportioned tower of Severndroog Castle and our private visit. After visiting Severndroog Castle those who have done enough in their day, just over 4 miles, may wish to retire to the nearby bus stops. Those wishing for more wonderfully dense woodland and wide vistas are welcome to continue around Shooters Hill for views over huge swathes of Kent, Surrey, Essex and the Thames Estuary. We’ll then drop down steeply to Plumstead Common for buses into central London and finish at Plumstead railway station for trains. PLEASE NOTE. Severndroog Castle has been saved by a small charity with limited resources and they cannot be expected to open and guide us around the building without some recompense. The usual admittance charge of £2.50 will have to apply. If ever there was a bargain this is it, for you can see seven Counties at a tenth of the price of a visit to the Shard. The route is steep in parts, contains many steps, and depending on weather conditions it may be muddy. We will be very high up by London standards and warm, windproof, clothing and gloves are most strongly recommended. A packed lunch is essential and, if you have them, binoculars are a must. There’s no need to book but feel free to ask the Walk Leader, Ian Bull, for more details. Email, ianbull@btinternet.com Phone, 020 7223 3572. The weather forecast for Sunday looks good for walking and viewing, so it should be a great experience. 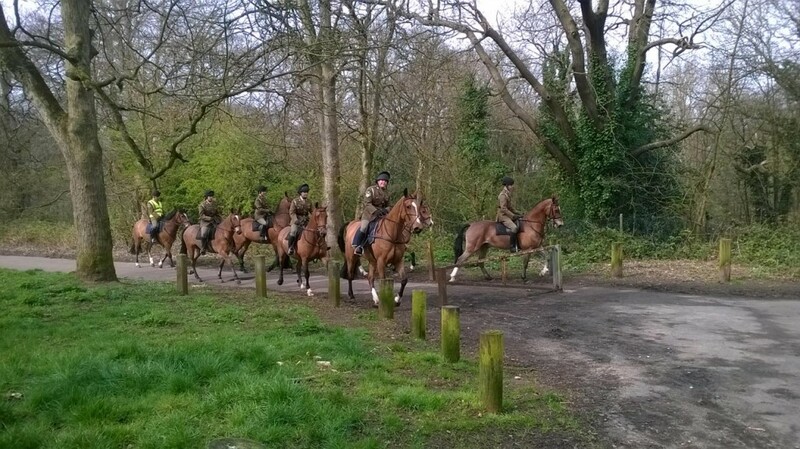 And if it’s done by 2.00pm there’s a members’ meeting down the hill at Woodlands Farm to go to. 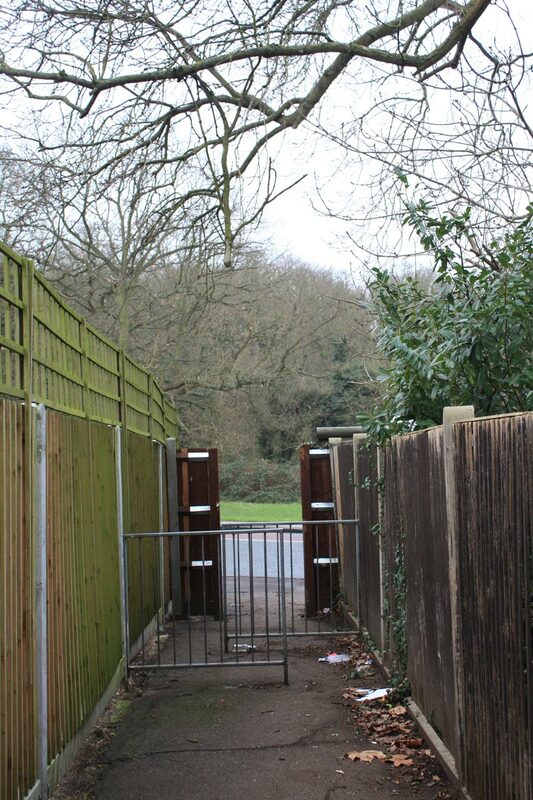 On 21 September 2013 you kindly posted some pictures and details of my attempts to get the Royal Borough of Greenwich to reopen the footpath between Shooters Hill Road and Academy Place. Since then I have been emailing the relevant official on a bi-monthly basis. The official told me in September this year that he would be getting legal advice on my contention that the path should be reopened in the basis that it had been used for 30 years by myself and others. Although I have yet to hear back from him I am delighted to see that the path has been reopened and cleared of growing vegetation and perhaps more significantly, the two “this is not a right of way” signs that had gone up in Academy Place have been taken down. I am still pressing the council to have the footpath and the adjoining lane from Academy Place to Bagshot Court adopted under the Highways Act to prevent their future closure. 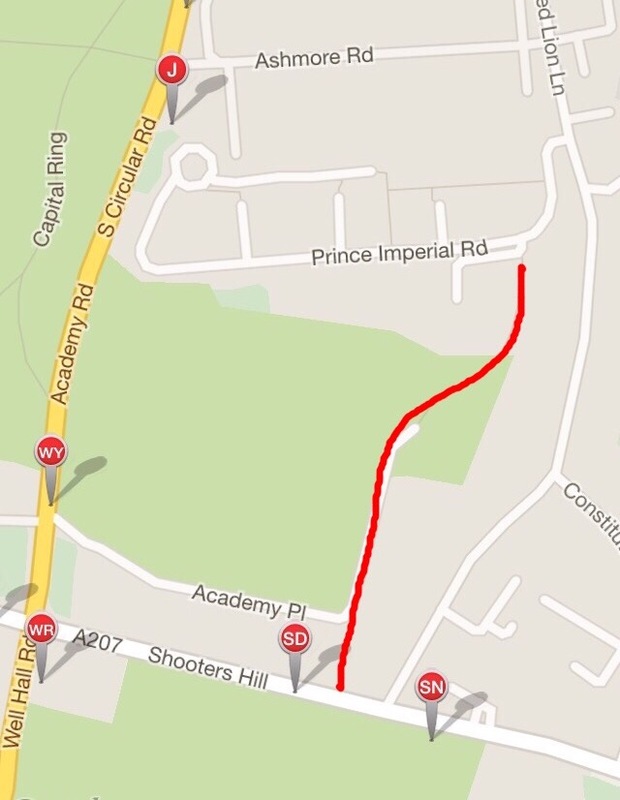 But the reopening of the footpath means that it is possible to walk again from Shooters Hill to Red Lion Lane via Bagshot Court and Prince Imperial Way as marked in red below. I hope this means the path is now open permanently. It had been open for a while last year, but was then re-closed. I suspect that was because the barriers had been broken down by vandals. The route from Shooters Hill down to the bottom of Red Lion Lane is a pleasant path through open fields, passing by what may have once been a sports field – the 1914 OS map shows a pavilion at the South end of the field. The old map also shows a miniature rifle range and formal rows of trees, both features are still evident though the only reminder of the rifle range is an embankment. Meanwhile, on the other side of the Hill, the problem of the route of the Green Chain Walk near Woodlands Farm still hasn’t reached a conclusion. While the Woodland Farm Trust, Ramblers and Green Chain officers have all agreed that Woodland’s proposal for re-routing the path to go along the edge of the farm is acceptable, the owners of the land between the farm and the corner of Keats and Dryden Roads are now blocking progress. At the last Woodlands Farm AGM it was mentioned that this route is a permissive path and that the owners Bellway have refused permission for the Green Chain Walk to cross their land. In the meantime the Walk is still diverted along residential roads round to Oxleas Wood. Update 23rd January 2015. 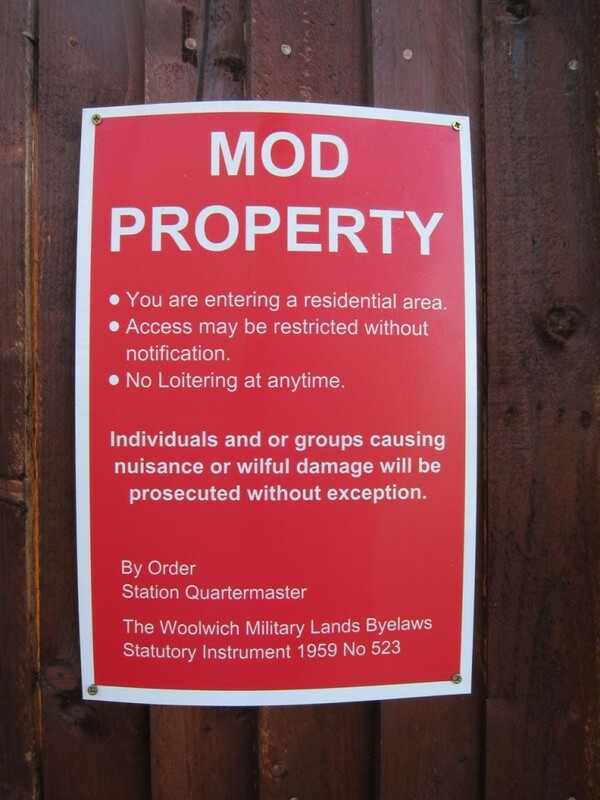 Steve e-mailed to let me know that new signs have been erected on the Castlewood footpath, presumably by the MoD. There’s a picture of one of them below. We’ll gently climb to some of the highest points in the city, suburbia giving way to outstanding views and miles of London’s best woodland, some established for 8,000 years. For lengthy sections you won’t know you are in a town, let alone the Metropolis as well over half the route is off-road. Despite travelling around an entire quartile of London we’ll cross just 40 surfaced thoroughfares. The route is steep in its latter parts, a packed lunch is essential, and of course you must be reasonably fit. You must also be able to sustain three miles per hour for most of a day and if you think you can, this particularly friendly event is the one Walk London walk that you should do. There is no need to book, just turn up and go, a remarkable day awaits you. One of the good things about the walk is that if 22 miles proves too much then it is possible to drop out along the way and get a bus or train home, and for those living in Shooters Hill the late lunchtime stop at the Oxleas Café can be an early finishing point if the legs are ready to give up after 16 miles. 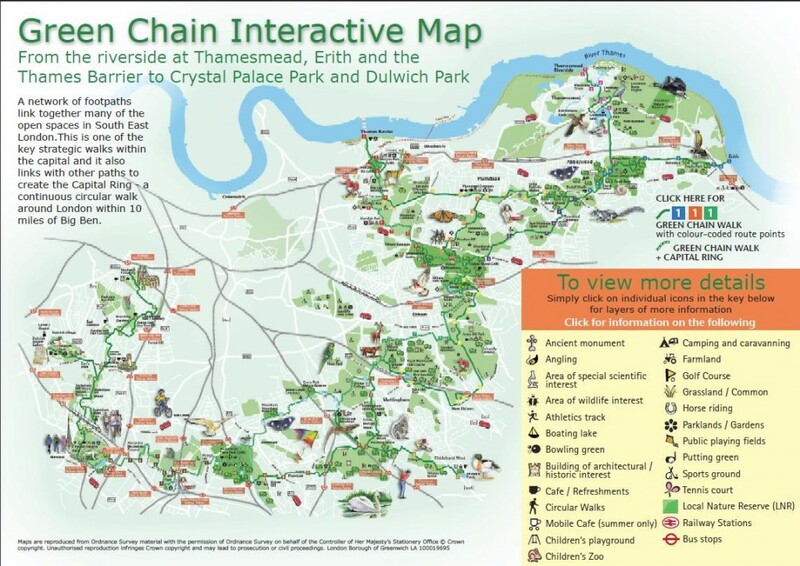 There’s an interactive map of the route of the Green Chain Walk on the Green Chain web site here. For further information about the walk contact Ian by phone, 020 7223 3572 or email – ianbull at btinternet dot com. The Green Chain Megawalk is by far the longest of the Autumn Ambles; most of them are just a couple of miles, and there are walks taking in Soho, St. Paul’s and the City of London. Looks like a good weekend for a walk. MIDNIGHT MEGAWALK – FRIDAY 5TH SEPTEMBER 2014. CRYSTAL PALACE RAILWAY STATION at 23.30. At last… There’s finally a strong chance of clear skies on Friday/Saturday 5th/6th September. No rain is forecast and it’s going to be nice and warm as well. There hasn’t been a clear Friday/Saturday since late May – not one! This is your chance to experience a very pleasant walk in remarkable conditions. There are miles of dense woodland on our route and in them it will be jet-black. Barely a photon will disturb us when we stand still for a moment and listen to the nocturnal wildlife quietly scurrying through the undergrowth. As first light begins to show at about 04.00 the sky will gently become turquoise from the North leaving black to the South and from our best vantage points, London’s streetlights gleaming gold beneath us. The views are glorious, the darkness delicious, and the landscape is London’s best. There’s no need to book and no charge, just turn up, but feel very free to ask me in advance for further information. * We meet outside Crystal Palace railway station at 23.30 on Friday 5th September. * The pace will be leisurely, we don’t even have to make average walking speed. 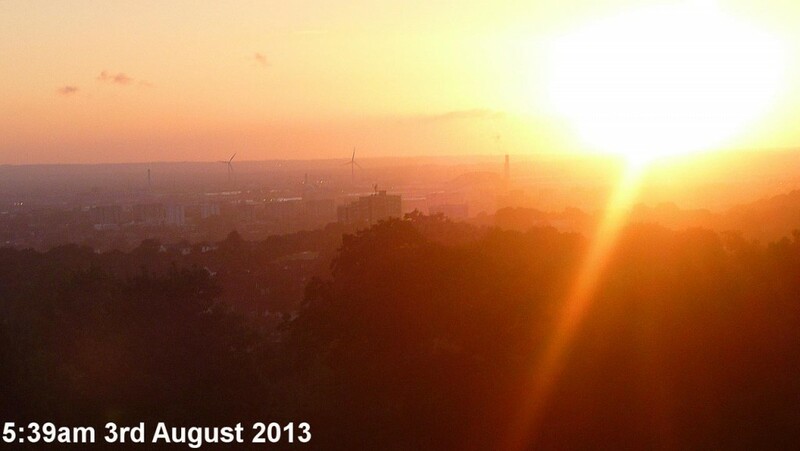 * The aim is to see the Sun rising over East Anglia and the Lower Thames from Shooters Hill, very nearly London’s highest point, at 06.21 and we will achieve this. * The overall distance is 21.5 miles but a 1.5 mile diversion through excellent woodland will be offered to see the Gothicky (spooky?) Severndroog Castle. There are benches for a nap for those who don’t want to do this. * After sunrise we’ll traverse Bostall Woods and Lesnes Abbey Woods. About four miles of these, and the latter has been there for 8,000 years, London’s finest ancient woodland. * Finish at Erith about 08.30 for a train home. No engineering works – 33 minutes to London Bridge. * Some participants traditionally have a breakfast together in a Café near London Bridge after the event. If you prefer to walk the Green Chain in the light of day Ian is also planning to hold a day-time megawalk on Saturday 27th September. – This is without doubt one of the most fascinating walks possible in South East England. In a most attractive way it explores the Thames between bucolic countryside and the intense development of the World’s greatest commercial centre. This isn’t so much a walk as a journey. 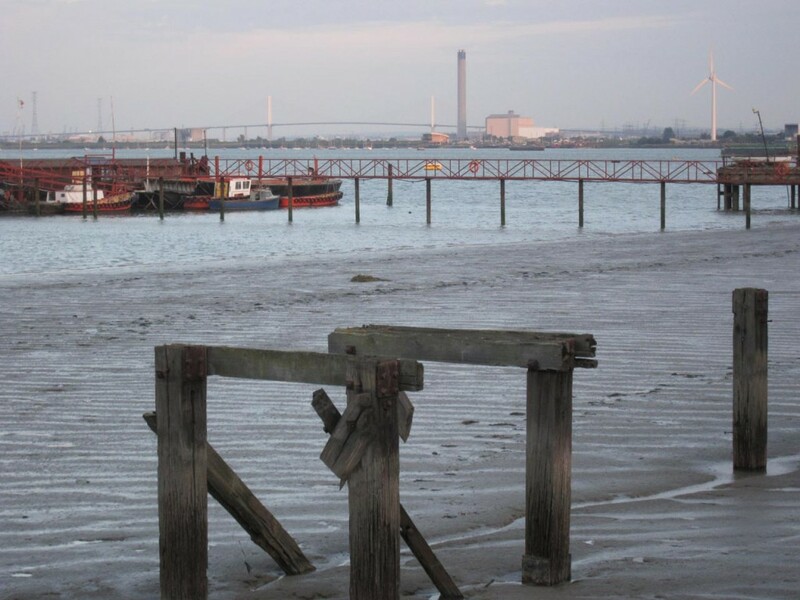 – We begin in the farmland of London’s Green Belt beside the River Darent, a stones-throw from Kent, arriving at Crayford Ness and confluence with the Thames by way of brackish marshes rich in bird life. We then receive the almost magical experience of seeing the great river progress from pre-estuarine bleakness to the heart of urbanity. – The transition between the contrasting landscapes is both inexorable yet surprisingly gentle as the natural environment penetrates well into London. Typically, whilst passing Bulrushes reclaiming an old wharf we might already see the towers of commerce rising before us. – The walk is also a historical timeline for London. We’ll pass evidence of almost every aspect of the city’s economic and industrial past from agriculture and fisheries through iron and shipping to electronics and nuclear engineering. We’ll conclude besides one of the most famed examples of the built environment anywhere on the planet, Wren’s magnificent work at Greenwich. Overall, this walk is a feast for both the eye and the mind, no wonder it’s proven so popular. The walk starts at 10.00am at Slade Green Station and finishes at Greenwich. Both walks are free and booking is not required. – The title of this walk says it all and participants will not be disappointed. 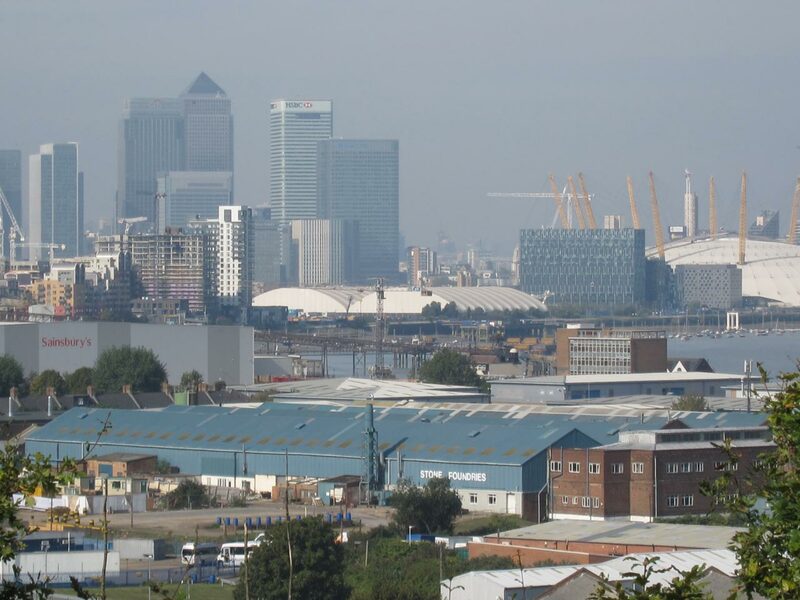 – South East London is sometimes dismissed as a sprawl of suburban housing. This couldn’t be further from the truth, the area contains the finest landscape in London. Thanks to that quality the South East was chosen in 1977 as the location for London’s first long distance footpath network, the Green Chain. – This walk naughtily picks the very best parts of the Green Chain system and combines them into one gem, perhaps the most attractive foot journey that London can offer. There will be miles when you’ll have no idea that you are within a City. 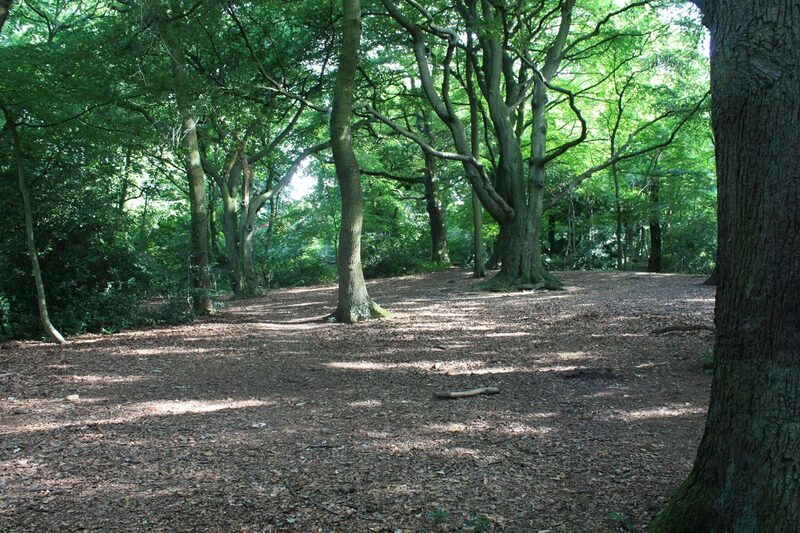 The Woodland is ancient, extensive, and dense, it was recorded by the Romans and pre-dates them by millennia. – Within that woodland we’ll meet one of London’s least known ancient monuments, the ruins of Lesnes Abbey. Already having met some notable gradients we now start climbing consistently, to well over 400 feet. As we progress you’ll notice ever more extensive views unfolding and at every stage you can be sure of ever better views and landscape before you. A Victorian interlude at Plumstead Common preludes further ascent towards Shooters Hill and, if the weather is clear, views out to the North Sea. The summit of Shooters Hill with its great vista over Kent and Surrey is crowned by yet more ancient woodland and nestling within it we’ll find the remarkable Severndroog Castle. From here it’s a short walk to buses for home and memories of a day you won’t forget. Please note that our route is very steep in places, a packed lunch is essential, and there are few places to re-stock along the way. 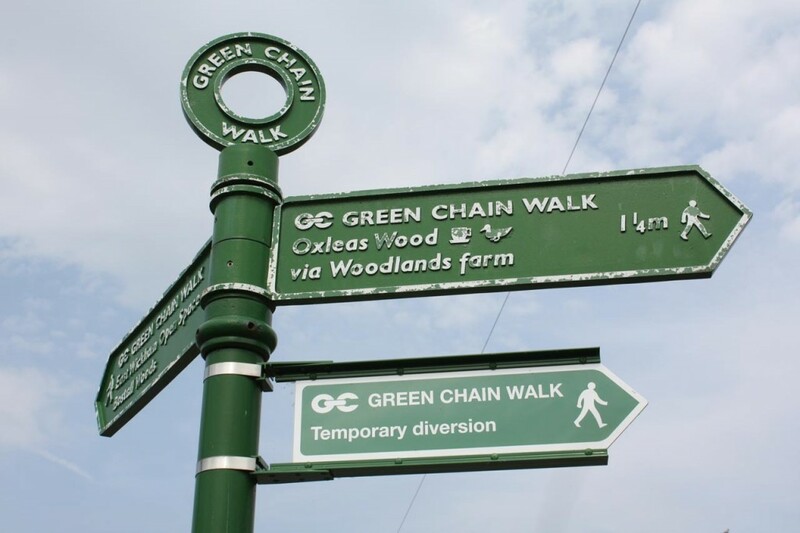 – The walk leader is the Green Chain Walk’s surveying contractor and will be delighted to share his extensive knowledge. While walking with Ian you could also ask him about the railway system that used to run in the Royal Arsenal at Woolwich and the restoration of the Woolwich steam locomotive. Ian is scheduled to give a talk about “The narrow gauge railways of the Royal Arsenal” at the Greenwich Industrial History Society meeting on 17th June. It starts at 7.30pm at The Old Bakehouse, Bennett Park, SE3, behind Age Exchange in Blackheath. I’ll be leading a walk on the Green Chain from Charlton to Plumstead via Maryon Park, Charlton House, Woolwich Common, Severndroog Castle, and Shooters Hill etc. All are welcome, no need to book, and it’s free of charge. 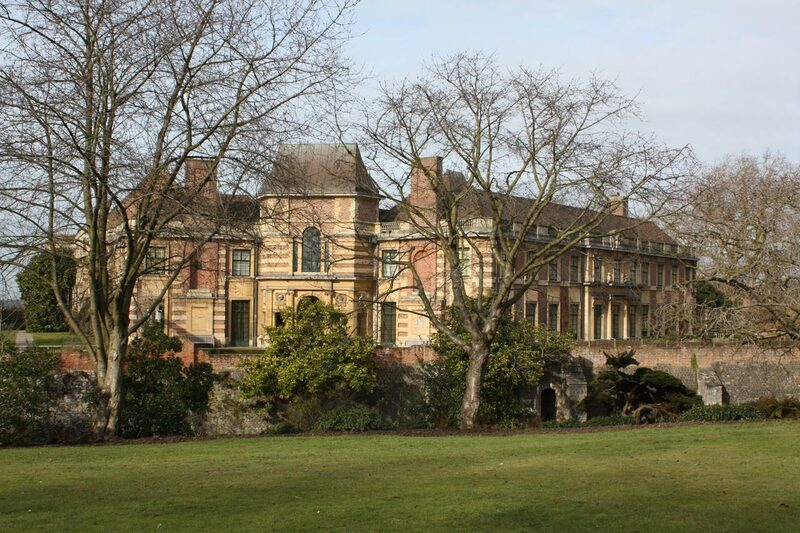 We’ll have lunch at Charlton House. Meet 11.30 at Charlton railway station. Finish 17.00 at Plumstead railway station, seven miles long. A packed lunch and waterproof footwear are essential. I’ve spent a great deal of time on Shooters Hill in the past few weeks. As lovely as ever, but isn’t it muddy? I suppose that’s what comes from a hill made of Clay! The walk is one of many across London as part of Walk London‘s “Winter Wanders Weekend”. I notice Ian is also leading a walk on Sunday, A Cathedral of Steam and the mature Thames – Plumstead to Woolwich Arsenal, which includes a private visit to the Crossness Pumping Station. Unfortunately this is already fully booked. 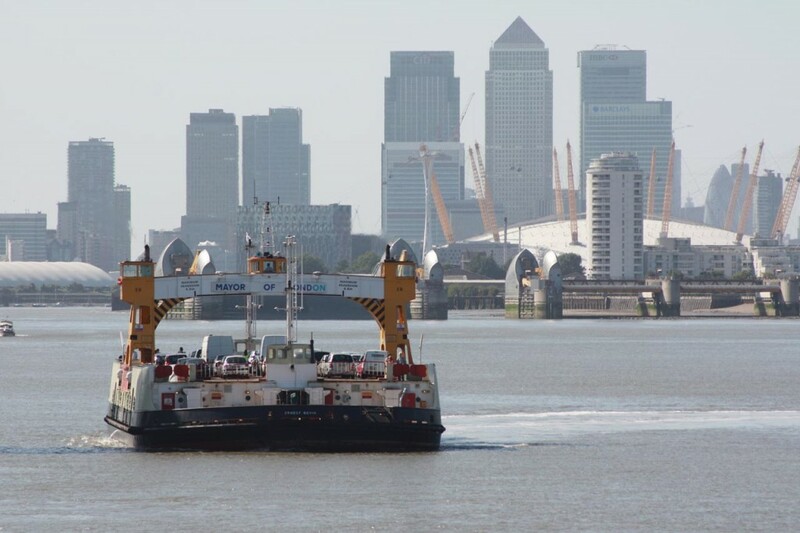 Start your walk along this part of the Capital Ring with a ferry across the Thames to the Royal Docks and a walk through Beckton parks, the Greenway and the Lower Lea Valley to the largest remaining C18th tidal mill at Three Mills. The walk takes in the Greenway, Bazelgette’s famous raised sewer that combated the “Great Stink” and cholera outbreaks. Saturday 28th sees the seventh ‘Green Chain Megawalk’. This very popular 21.5 mile stroll leaves Crystal Palace railway station at 09.15, arrives at the Oxleas Wood café at about 14.30, and finishes by the Thames at Erith at about 18.30. The aim is see many of the really good parts of the Green Chain in one day at average walking pace. A packed lunch is essential and there are more details here http://www.walk4life.info/events/londons-ultimate-walk-the-green-chain-megawalk . One of the best aspects of this walk is the excellent camaraderie generated between participants, some making life-long friends. 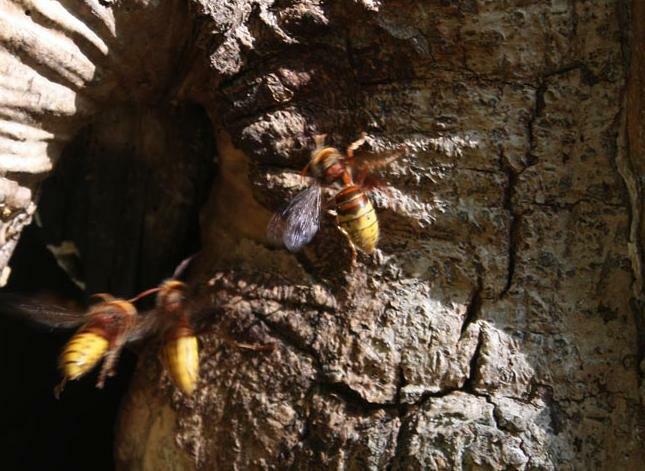 Look out for, and be careful of, the Hornets’ nest in a hollow tree just down the hill from the old concrete tank in Oxleas Wood. Sunday 29th sees us exploring attractive parts of the Green Chain that haven’t featured in Walk London’s programme before. Indeed, few organised walks have. 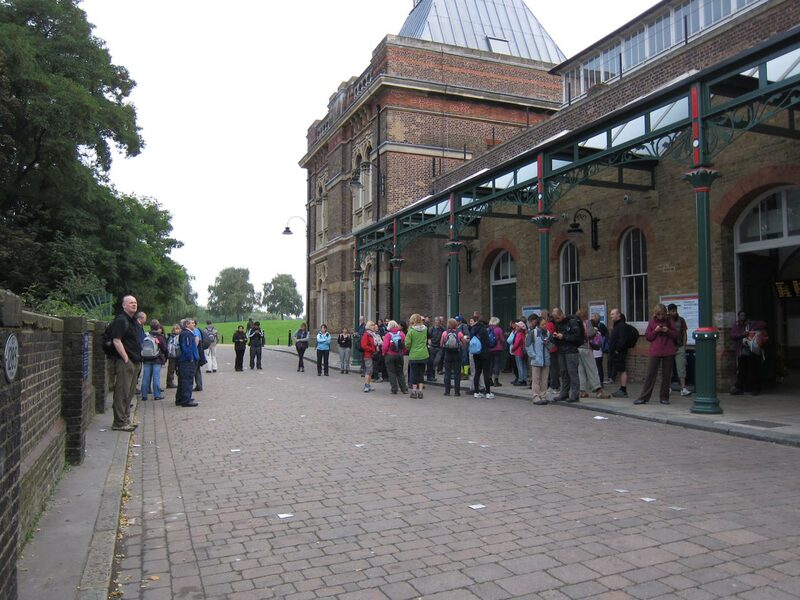 This 10.5 mile walk starts at Eltham railway station at 12.00 and will finish at the Oxleas Wood café at about 17.00. There will then be an extension for those interested down to Plumstead Common via Shrewsbury Park for trains from Plumstead railway station. Again a packed lunch is essential for people who won’t have already eaten by the state time. We’ll take lunch either at King John’s playing fields in Southern Eltham or at Chinbrook Meadows depending on what the walkers want to do. There are more details here http://www.walk4life.info/events/unknown-delights-and-gems-south-east-london. There’s no need to book for these walks. Ian can be contacted for more details on ianbull at btinternet dot com. Sounds a great weekend for walkers. A leisurely 22 mile stroll over the most popular sections of the Green Chain Walk from Crystal Palace to Erith, but with a difference, the walk is nocturnal! Meet outside Crystal Palace railway station at 23.45pm. After the first five miles we enter pitch black woodland. Quite amazing! By the time we get to Eltham we’ll see wonderful views of London at first- light. This was so good last year that we spent about 20 minutes watching. At around 05.00, after much more dark woodland we arrive at Shooters Hill for sunrise, and there’s no where better to see it as the view extends right over Essex and the estuary. The rest of the walk is mostly in woodland which looks lovely at that time of the morning. We arrive at Erith and the Thames at about 08.00 for plenty of trains home. 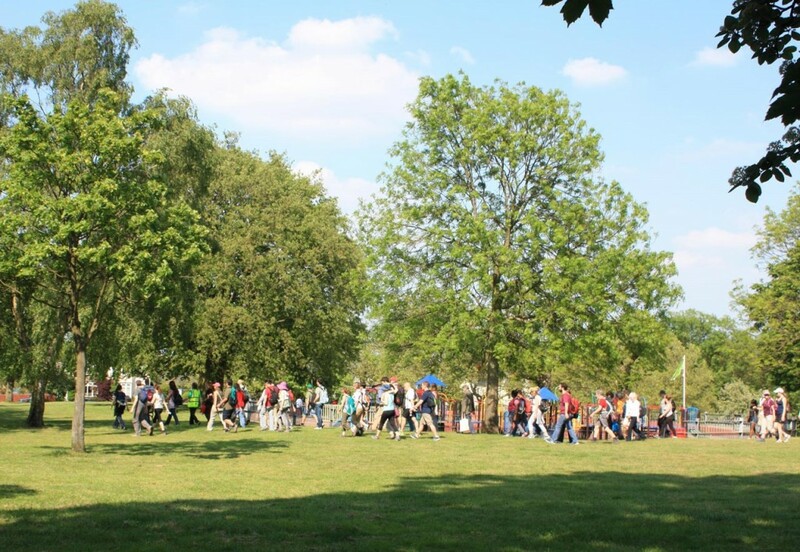 TfL has offered to fund Walk London’s ‘Autumn Ambles’ and thus the 7th ‘Green Chain Megawalk’ will go ahead on Saturday 28th September starting from Crystal Palace railway station at 9.15. It’s the same as the above but in daylight. Two councils are hoping to settle a long-running dispute with landowners over public access to tracks in Woodlands Farm. 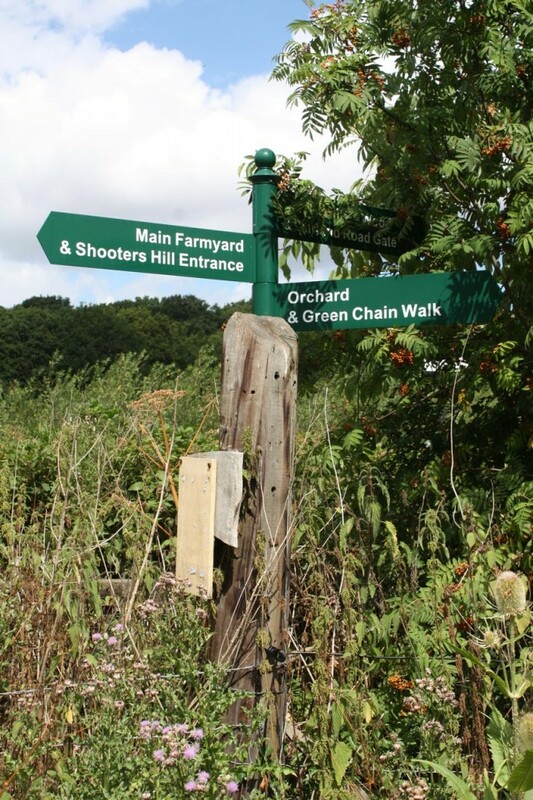 Bexley and Greenwich councils have already been to the High Court, seeking to force landowners to admit that the tracks which criss-cross farmland between Edison and Glenmore Roads, in Welling and Shooters Hill, are public footpaths – ‘even though they’re not listed on’ rights of way maps. The boroughs quizzed 11,000 locals to gain evidence supporting their claims and obtained High Court writs against the landowners who have fenced off the tracks. But over a year later agreement has still to be reached with the George Wimpey Company and the RACS Co-op, joint owners of the land at Woodlands Farm. A Co-op spokesman said opening up the path would re-expose the farm to problems with motorcyclists and trespassers which had stopped when the fences went up. He said that the society disputed that the paths had been public footpaths in the first place. The councils are anxious to secure the footpaths in order to link up with a footbridge across the southern approach road to the East London River Crossing. I came away with a view that common sense needs to prevail & that the GCW needs to amend its route. I have since discussed the matter with the Blackheath Ramblers Group committee & the committee fully supports this approach. I have also spoken to the footpath officer for NW Kent Ramblers who commend the trustees of the farm in their efforts to find a sensible solution for all concerned & support the proposed alteration. So, in summary, the two Ramblers Groups which cover the farm area are in support of the proposal made by the trustees & we feel that Ramblers should be working with the GCW committee to get this alteration accepted. Board members have been working with Green Chain officers and the Bexley access officer and significant progress has been made on resolving the problem of the Green Chain Route across the farm. A temporary diversion is at present in place and it is hoped that a diversion around the perimeter of the farm which would provide an acceptable, enjoyable alternative walk will be agreed on by all parties. There are diversions in place: the photo at the top shows the changed sign at the Keats/Dryden Road end of the path. At the Oxleas Wood end it’s not quite so clear and the signpost in the farm itself is unchanged and points to the blocked path. I could only find one other changed sign post, at the junction of the eastern-most path in Oxleas Wood and Shooters Hill, and that had been crudely adjusted to point in the new direction and only has the words on one side of the pointer – not so good if you are approaching from Shooters Hill. At the Dryden Road end the diversion sign posts point prospective Green Chain walkers down Chaucer Road and Wickham Street, past Shoulder of Mutton Green to Bellegrove Road, and then to Oxleas Wood. Quite a lot of road walking, and I wonder why they didn’t take the greener route via Footpath 245 near the Green Man pub and then along Hill View Drive to Bellegrove Road. The proposed re-routed Green Chain Walk would also include part of Route 245. It sounds like the long-running battle over the Green Chain path through the farm is drawing to a sensible conclusion. Meanwhile, on the other side of Shooters Hill, the path down the side of the former Castlewood Day Hospital is still blocked, despite the intervention of local MP Clive Efford.